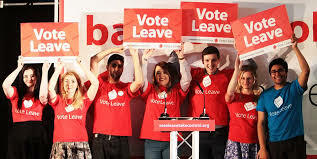 Vote Leave was the official campaign for Leaving the EU. It paid AggregateIQ, an “obscure” Canadian company, a large portion of its budget, that is £3.9m, to do its data analysis. Its address and telephone number were those of SCL Canada, one of Cambridge Analytica’s overseas offices. A former employee of Cambridge Analytica described it: “The Canadians were our back office. 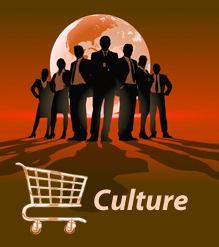 They built our software for us. They held our database.” Although AggregateIQ was not owned by Robert Mercer, most of their work was for him or Cambridge Analytica, and their intellectual property for that work, including that done during the US elections, was owned by Mercer. Illustration: James Melaugh from ‘The Great British Brexit Robbery: How Our Democracy Was Hijacked.’ The Guardian. 7 May 2017. Thomas Borwick, a consultant for SCL and Cambridge Analytica was Vote Leave’s chief technology officer. Mark Gettleson, a focus group expert, was also a consultant for SCL and Cambridge Analytica and a core member of the Vote Leave team. Cambridge Analytica’s vice president, Steve Bannon was a friend of Nigel Farage, leader of the UK Independence Party (Ukip) and Leave.EU. Bannon had “opened the London arm of his new website Breitbart in 2014 to support Ukip”. Robert Mercer is also a friend of Farage. Reference: Carole Cadwalladr. ‘Revealed: How US Billionaire Helped to Back Brexit.’ The Guardian. 26 February 2017; Carole Cadwalladr, ‘Robert Mercer: The Big Data Billionaire Waging War on Mainstream Media.’ The Guardian. 26 February 2017. Andy Wigmore, Leave.EU’s communications director, told the Guardian that Cambridge Analytica’s artificial intelligence (AI) was what won the Leave campaign. Cambridge Analytica taught his team, without payment, how to glean huge amounts of data from people’s Facebook profiles so as to target them effectively. 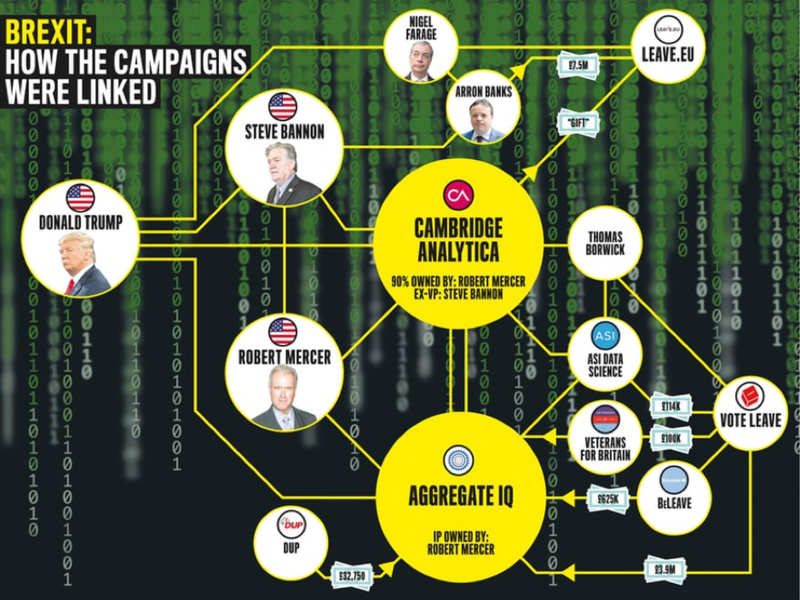 The Leave campaign was able to create a database of over a million people to target with advertisements varied according to their supposed personalities, using Cambridge Analytica data. Reference: Wigmore quoted in Carole Cadwalladr, ‘Robert Mercer: The Big Data Billionaire Waging War on Mainstream Media.’ The Guardian. 26 February 2017. Because using artificial intelligence, as we did, tells you all sorts of things about that individual and how to convince them with what sort of advert. And you knew there would also be other people in their network who liked what they liked, so you could spread. And then you follow them. The computer never stops learning and it never stops monitoring. Reference: Carole Cadwalladr. ‘The Great British Brexit Robbery: How Our Democracy Was Hijacked.’ The Guardian. 7 May 2017; Carole Cadwalladr, ‘Robert Mercer: The Big Data Billionaire Waging War on Mainstream Media.’ The Guardian. 26 February 2017. Vote Leave gave Veterans for Britain £100,000 in the last week of the campaign which it paid AggregateIQ to identify a small number of “persuadable’ voters and bombard them with ads. The company approached Veterans for Britain for the contract, claiming they could target voters using behavioural insights.